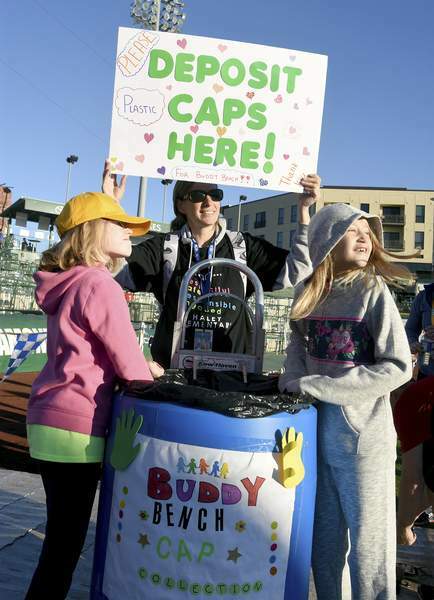 Rachel Von | The Journal Gazette Sammie Vance, 8, left, her mother Heidi Vance, center, and Becca Eifrid, 10, collect bottle caps for the Buddy Bench Cap Collection on Saturday. After a hard run, the first thing many runners reach for is a bottle of water. And then, they wonder what to do with those little plastic caps. Saturday, at Fort4Fitness, 8-year-old Sammie Vance had a solution. She and some friends stood by a big blue plastic drum and held up signs telling runners they could deposit their bottle caps to help Haley Elementary School in Fort Wayne earn a Buddy Bench. Buddy Benches are places where “if somebody is lonely, they can sit on the bench and then somebody can come up to them and they can meet some new friends and play,” Sammie said. So she and her mom, Heidi Vance, 36, went into action, finding a company in Evansville that will make a bench from 400 pounds of plastic bottle caps – about what would fit in 10 55-gallon drums. The two started contacting community groups and schools to get them to collect caps. They persuaded the Fort Wayne Children's Zoo and the Fort Wayne TinCaps to participate. Announcements about the drive were even made during games, Heidi Vance said. The drive has an information page on Facebook at Sammie's Buddy Bench Project. It includes collection locations and is updated daily, Heidi Vance said.